In the Pagan calendar, called The Wheel of the Year, Samhain is the time when the boundary is thinnest between the worlds of living and dead; the powers of divination, the Sight, and supernatural communication are strengthened on Samhain night, and it is considered a powerful time to communicate with lost loved ones. Pagans celebrate Samhain as an acknowledgment that without death, there can be no rebirth. At Samhain the darkness increases and the Goddess reigns in her powerful aspect of the Crone. It is a time to honour and to call on those who have gone before in order to gain insight about our life. SOuL Searchers is a subgroup of the Pagan group Spheres Of Light (SOL). Not all members of SOL are actively involved in SOuL Searchers, and not all members of the SOuL Searchers team are members of the SOL Dark Moon group. The Spheres Of Light Dark Moon group celebrated Samhain with a ritual to honour our ancestors, and also conducted a séance during the proceedings. The non-Dark Moon members of SOuL Searchers, along with some other guests, were invited to attend the ritual and to take part in the séance. 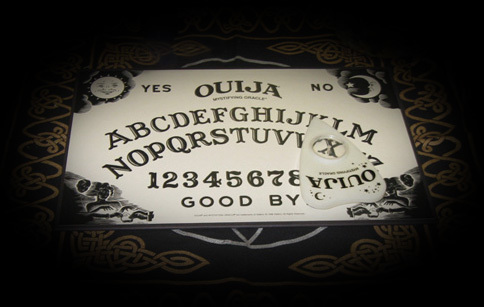 The purpose of the séance was to learn about the different methods of channelling. The circle was strictly controlled and fully closed down at the end of the session. We also gave any grounded spirits an opportunity to cross over on the night if that was their wish. 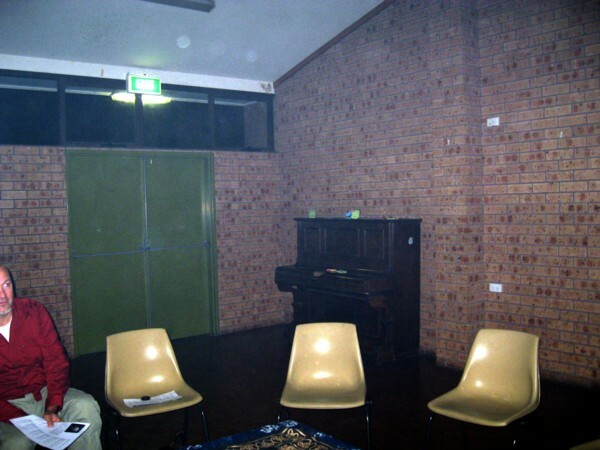 In addition to the séance we conducted an experiment with orbs where we photographed the room before the ritual, and then again afterwards to see if there was any visible increase in orb activity. 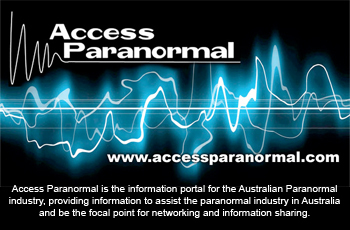 We also called on the orbs to appear in certain areas of the room as we photographed, based on the premise that if they are intelligent entities and not just random dust particles etc, that we may be able to influence their appearance in our photographs. Photos taken before the ritual began, shortly after we all entered the room, yielded an average of 1.1 orbs per photograph. Photos taken after the ritual, about 1 1/4 hours after the first photos, yielded an average of 2.8 orbs per photograph. The photos below are just a few examples of the many “before” and “after” photos taken. 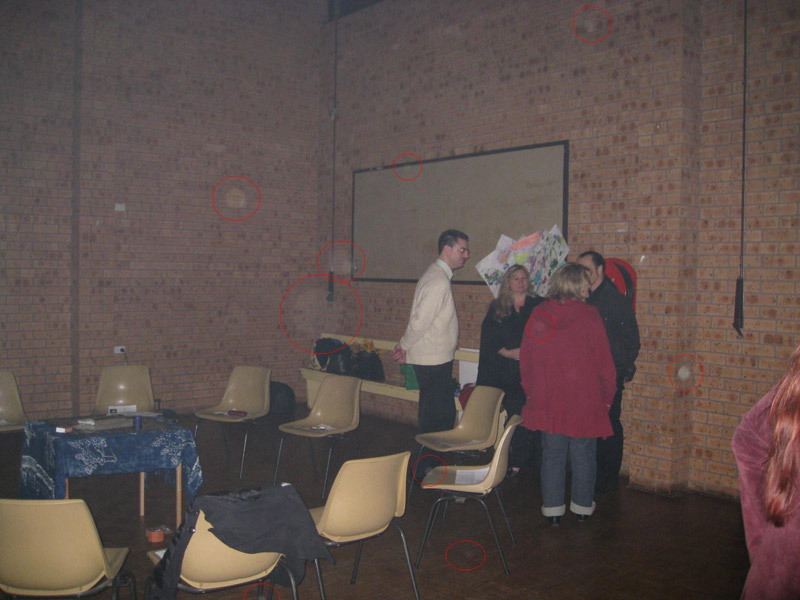 In the first two photos the orbs that were counted have been circled in red for clarity. In the first photo the room is rather hazy due to the presence of smoke from the sage smudge stick used to ritually cleanse the area. 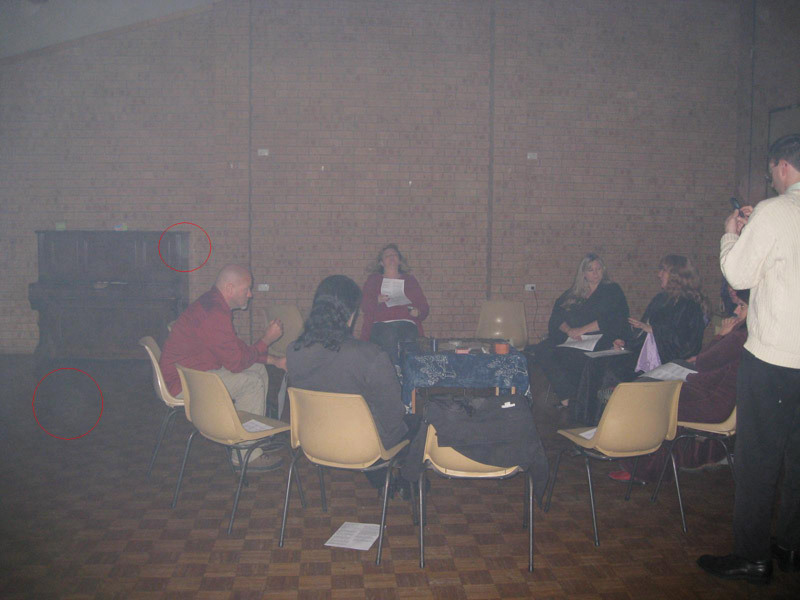 “Before” with 2 orbs circled in red. “After” with 9 orbs circled (plus partial orb at bottom of frame). 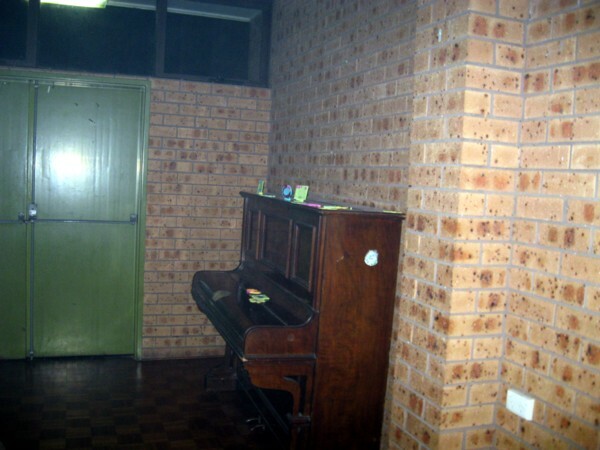 “Before” – no orbs visible. 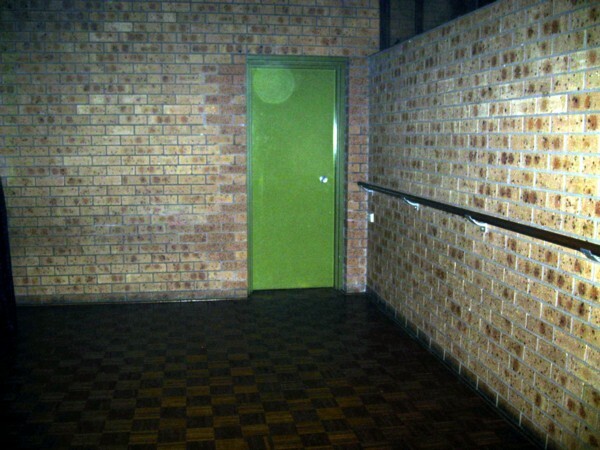 “Before” – again, no orbs visible. 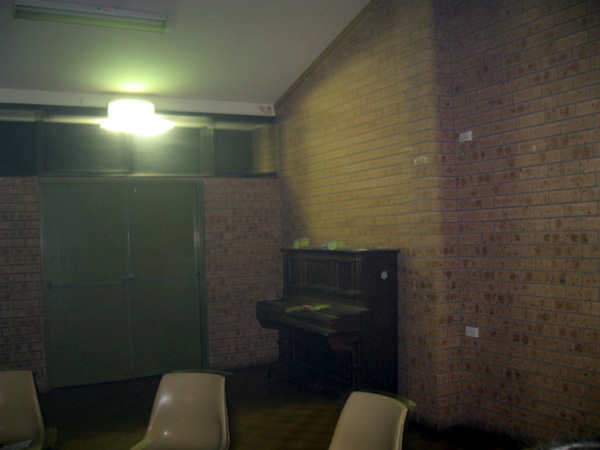 “After” – orbs on ceiling. 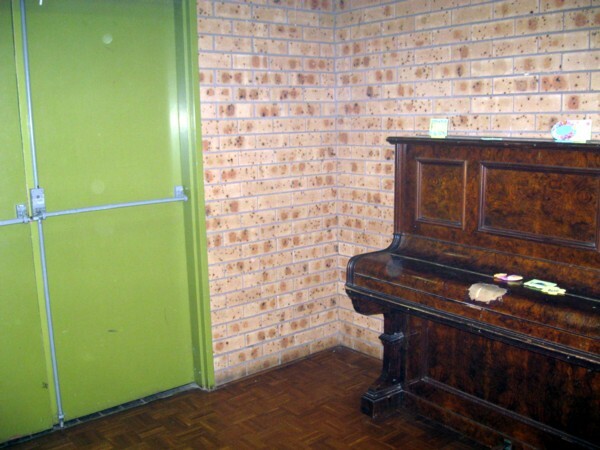 “After” – orbs on door and piano. 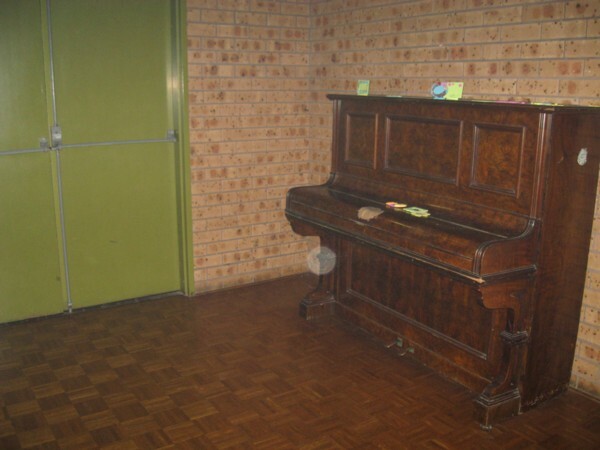 “After” – large orb on piano. “After” – larger orb on door. It is clear from the results that there is a very large percentage increase (254%) in the number of orbs appearing immediately after the ritual, and during the time we were “calling” them to appear. Unfortunately the results of our orb experiment were not very spectacular and far from conclusive, due to the small sample size and other uncontrolled variables. The overall result is inconclusive as it is doubtful that the increase in orbs is due to conscious participation on the part of the orbs, and is more likely attributed to a change in the air quality in the room (ie. the amount of dust and moisture in the air) caused by the presence of 13 people moving around, breathing, smudging with smoke and stirring up any dust particles.